There’s nothing wrong with the image quality of most standard zoom lenses, but they do have their limitations. Many have a variable maximum aperture that shrinks to f/5.6 at the long end of the zoom range. This translates to a fairly large depth of field, making it difficult to blur the background. ‘Fast’ – ie wide aperture – prime lenses typically offer a maximum aperture of f/1.4 to f/1.8, so you can really make the subject stand out by reducing the background to a dreamy blur. Another drawback of standard zooms is that they tend to produce distortions, which switch from barrel to pincushion as you sweep through the zoom range. A prime lens is likely to be much better behaved in this respect, as it’s designed to work at a single focal length. But which focal length is best? Traditionally, portrait photographers usually prefer to use a lens with focal length of around 85mm. This enables them to fill the image frame for head-and-shoulders or half-length portraits, without needing to get too close to the subject and invading their personal space. This distance is, however, still close enough to engage with the subject and give directions. If you’re shooting with an APS-C-format camera, a 50mm lens is a better fit for most portraiture, as the 1.5-1.6x crop factor gives an effective 75-80mm focal length. Let’s compare the most appealing choices on the market. The choice award for portrait lens goes to the Tamron SP 85mm f/1.8 Di VC USD. It offers exquisite bokeh along with great sharpness and contrast. Better still, it boasts a highly effective optical stabiliser, which is massively helpful in capturing consistently sharp portraits in dull light. Like its 45mm sibling below, this optic is compatible with Tamron’s TAP-in console. This enables connection of the lens to a computer via a USB link for updating firmware and customising settings, such as fine-tuning autofocus. Physically smaller and lighter in weight than the competing Sigma 85mm f/1.4 DG HSM A, this optic is nevertheless larger and weightier than its EF 85mm f/1.8 USM rival (below) that shares the same maximum aperture. At 700g, it’s still entirely manageable and feels well-balanced on full-frame bodies, while the VC (Vibration Compensation) system is a bonus for handheld shooting in low lighting levels. As with the Sigma lenses below, the two Tamron's on test are also supplied with hoods to block extraneous light. Internal focusing, meanwhile, powered by ring-type ultrasonic systems, results in the front elements remaining fixed throughout the focusing range. At f/1.8, the Tamron is more than sharp enough for portraiture and the level of sharpness is consistent across the whole frame. Bokeh is wonderfully smooth, even more so than with the Tamron SP 45mm f/1.8 Di VC USD, helped by the longer focal length. One feature shared by all the most recent Tamron prime lenses, but lacking in the Canon and Sigma lenses on test, is optical stabilisation. When shooting portraits indoors under ambient lighting, even an aperture of f/1.4 or f/1.8 can require slow shutter speeds, unless you boost your ISO setting, which can degrade image quality. Tamron’s VC (Vibration Compensation) technology is highly effective, enabling shutter speeds of up to four stops slower before camera shake becomes a problem. Impressive build quality is matched by strong performance from the ring-type ultrasonic autofocus system and, more importantly, excellent image quality. Sharpness and contrast are impressive, even wide open at f/1.8, while bokeh is beautiful, giving a soft and creamy appearance to defocused areas. The lens isn’t completely free distortion like the Sigma 50mm f/1.4 DG HSM A, but there’s noticeably less barrel distortion than from either of the two Canon 50mm lenses on test. You certainly can’t accuse Sigma’s 50mm Art-line lens of being a lightweight contender, being physically twice as long and nearly three times heavier than the Canon EF 50mm f/1.4 USM. The reason for the upsizing and weight gain is that the Sigma has a much more complex design than the EF 50mm f/1.4 USM, with 13 optical glass elements and a well-rounded aperture, thanks to its nine diaphragm blades. 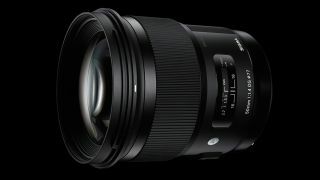 Another Sigma upgrade is that it features a fast and whisper-quiet, ring-type ultrasonic autofocus system, whereas the EF 50mm f/1.4 USM only has a motor-driven ultrasonic arrangement. At its widest aperture, this optic has better centre sharpness than any other lens in this group, along with superb contrast. Corner sharpness is comparatively disappointing, although it picks up well if you close down the aperture by a stop or two. Colour fringing is also very well contained and distortion is practically nonexistent. Put simply, all-round performance is exceptional. A supersized 85mm optic, this Sigma is a bit like the Incredible Hulk of portrait lenses. At 95x126mm and 1130g, it’s by far the biggest and heaviest lens in the entire test group. Uncommonly for a Sigma lens, everything’s wrapped up in a weather-resistant dust/splash-proof casing and, as with the 50mm Art lens also on test, it’s compatible with Sigma’s USB Dock for applying firmware updates and customising settings. Also like the Sigma 50mm lens, this one comes complete with a lens hood and padded soft case. Autofocus is fast, extremely quiet and unerringly accurate. Sharpness away from the centre of the image frame is outstanding, even when shooting wide open at f/1.4, although centre sharpness at the widest aperture isn’t quite as spectacular as from Sigma’s smaller 50mm Art lens. All in all, this lens delivers a superb performance, but it’s pricey and rather cumbersome for an 85mm prime lens. There’s a lot to love for this lens for portraiture with a full-frame camera like the EOS 6D Mark II and EOS 5D Mark IV. Furthermore, as one of Canon’s ‘recommended’ lenses, it is sufficiently sharp for use with the ultra-high-resolution EOS 5DS and 5DS R bodies. Like the company's EF 50mm f/1.4 USM, this one has a fairly well-rounded aperture based on eight diaphragm blades. It beats that lens by having a ring-type, rather than motor-based, ultrasonic autofocus system, which is both fast and very quiet. Sharpness isn’t spectacular at f/1.8 but, for portraiture, it’s easily good enough to capture individual hairs and skin pores, along with excellent detail in the eyes. Border sharpness, however, is generally unnecessary in portraiture, where you’re normally more concerned with defocused softness or bokeh, which it does very well. Overall, a top value choice for full-frame shooters. Certainly no heavyweight, Canon’s latest 50mm f/1.8 is only 30g heavier, 1mm wider and 16mm longer than the 40mm pancake lens on test. That’s pretty impressive, considering its longer focal length and faster f/1.8 aperture rating. At 49mm, the filter attachment thread is even smaller, but this time the front element is quite deeply recessed, which makes the ES-68 lens hood a genuinely optional accessory. As well as its more advanced autofocus system, other upgrades over the previous EF 50mm f/1.8 lenses include a metal rather than plastic mounting plate, and seven diaphragm blades rather than five, which give a more well-rounded aperture. This is particularly useful for avoiding the obvious pentagonal shapes of defocused bright objects when stopping down a little, which plagued images taken with the earlier 50mm lenses. Performance in terms of colour fringing is about equal to the previous version, and there’s marginally less barrel distortion. Overall, at this price, the 50mm f/1.8 STM is a steal. Bearing in mind that DSLR designs are often updated every couple of years or so, this lens seems positively geriatric, at 24 years old. Even so, it’s Canon’s top-spec 50mm lens, unless you’re willing to spend silly money on the f/1.2L edition. The design incorporates an ultrasonic rather than stepping motor autofocus system. Compared with ring-type ultrasonic systems, it’s relatively slow and noisy although, unusually for this type of system, it does feature full-time manual override in One Shot AF mode. The wide f/1.4 aperture enables marginally more blurring of the background than the EF Canon 50mm f/1.8 STM lens, and a more noticeable improvement than with the 40mm f/2.8 lens. The trade-off is that this lens is comparatively lacking in sharpness when used at its widest aperture, and still loses out to the cheaper EF Canon 50mm f/1.8 STM between apertures of f/1.8 and f/2.8. On the plus side, its wrinkle-blurring softness can reduce the signs of premature ageing in wide-aperture portraiture. This pancake lens is remarkably flat in its design, extending just 23mm from the host camera. It’s slim enough to slip into a spare pocket and, at 130g, weighs less than an eighth of the Sigma 85mm lens on test! Despite its incredibly small design, the EF 40mm is compatible with full-frame as well as APS-C DSLRs, and features a metal rather than plastic mounting plate. The inner barrel of the lens physically extends at shorter focus distances, but the 52mm filter thread doesn’t rotate during focusing. With its focal length of 40mm being the widest on test and a relatively narrow aperture rating of f/2.8, this is the worst lens in the group for getting a tight depth of field. In other respects, however, image quality is very pleasing, with good centre sharpness, even at f/2.8, and corner sharpness becoming very good at f/5.6. Colour fringing and distortion are also well controlled, making the little pancake lens worth considering for portraiture on an APS-C body, such as the EOS 800D.